Now that the playtest era has finally come to an end it’s a blessed relief to finally get my hands on a proper Players Handbook and get stuff into gaming rather than theorising. Sure the Starter Set kept me in the game for a while, but this is the real deal. First things first, let’s make a character. And while we’re at it, let’s kick it up to level 3 which is where all the juicy stuff starts. 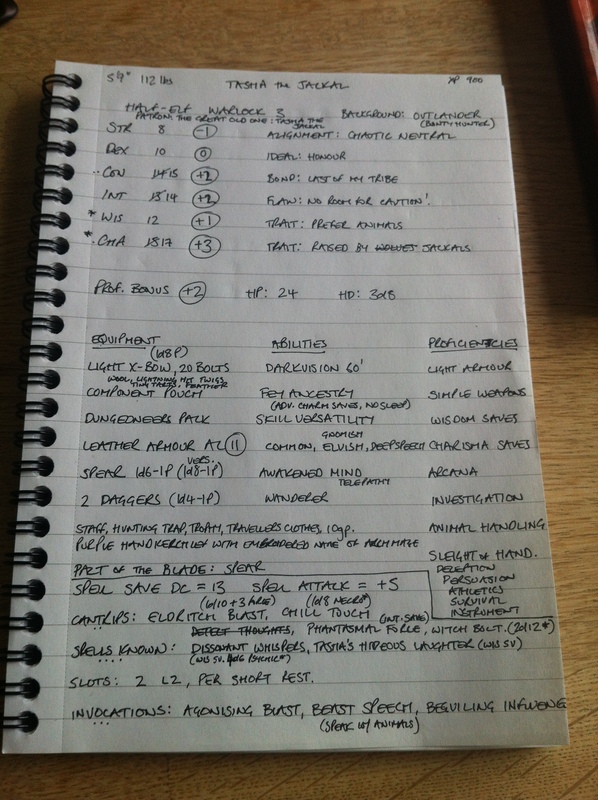 I went for a classic pen and paper approach, and scribbled down my stats straight away. I picked a Warlock for no other reason that I thought it was a bit funky, and I really like the character art. I assigned stats, noting that I’d need to go big on Charisma first and Con second. There’s a decent step by step overview in Chapter 1, but I’m already having to keep my fingers in a few pages as I flick back and forth. Chapter 1 does have a neat table that shows you which races get which stat bumps. I’m no min maxer, but it seemed like a good idea to go either Tiefling or Half-Elf for the extra Cha. I went Half-Elf, noting thta the races are not presented in strict alphabetical order. You get common races first, then the uncommon ones. Hope my DM doesn’t object to Half-Elves then. Stats are simple enough, boni follow no problem. As I worked through the race and class chapters I noted any proficiencies as they came up. This turned into quite a list, and I like that actually, far more than a big list of skills. I know they’re kind of the same thing, but this looks good on my notes. I skipped all the spell stuff for a while as I wanted to get the third big choice done first; background. I plumped for Outlander as I was increasingly seeing my character as someone who was a bit of a wanderer, perhaps even a planar one, who ended up encountering something extraordinary which got her started on a life of adventure. All this kept adding to my three lists of equipment, abilities and proficiencies. Couple of decisions to make along the way, but not many, instead it was more about firming up my concept as I went along. By now, my character was brought up by wolves, and wielded simple weapons and leather armour. I was getting more and more of a tribal vibe. 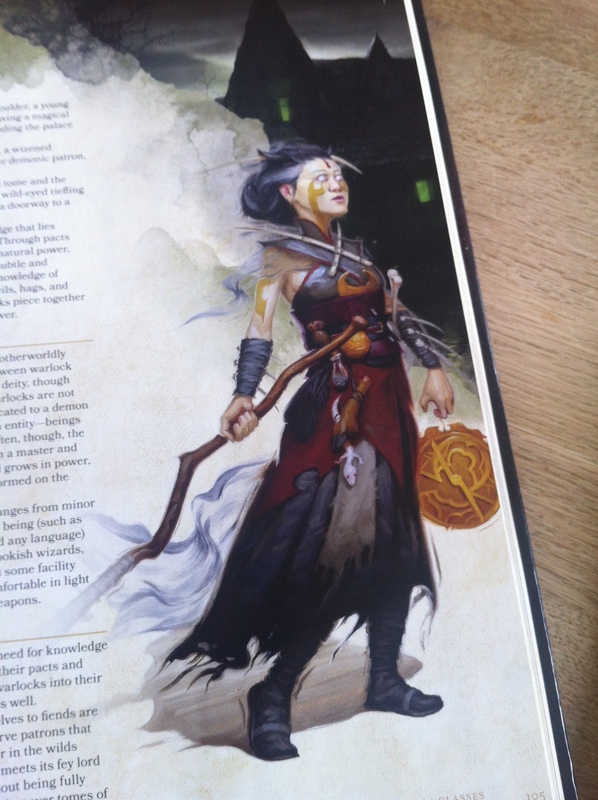 The two big Warlock decisions were Otherwordly Patron (I plumped for Great Old One) and Pact Boon (Pact of the Blade). Invocations looked more like old style feats that I thought they would, but they were simple enough to pick as previous choices had made many of them ineligible. Spells next, and I had to read the Pact Magic section a couple of times to get it right in my head. This is one of those times where prior edition knowledge can be a dangerous thing as it leads to incorrect assumptions. Double checking a few things, and the list came together relatively quickly. Definitely need an extra cheat sheet though, or even cards until I’ve internalised all the effects of each spell. Every time I see a bit of flavour I add it in, including spell components. And she’s done! Total time, about 45 mins. Tasha the Jackal, female half-elven warlock, whose patron is a long forgotten tribal god of trickery and laughter. She is slight of build, yet tough. She carries fetishes and small pouches full of oddments about her (including a purple handkerchief embroidered with the name of a powerful arch mage), and is armed with small knives and a crossbow. She can produce a mystical and ancient spear from thin air that crackles with eldritch energies. She rarely speaks, and when she does it’s with beasts by preference before the civilised races. Sometimes her lips don’t even move all day, yet still she is a persuasive presence. Really happy with that process. Little bit of back and forth, and I’m spoiled by already knowing the rules of the game, but even so, pretty painless. Very inspiring at little steps along the way. Didn’t have much of a concept in mind at the start but the whole thing came together really well. I’d love to play this character!